But Builsa South Member of Parliament Clement Apaak wants the bill “shelved. “It is needless, unnecessary and retrogressing,” he added. 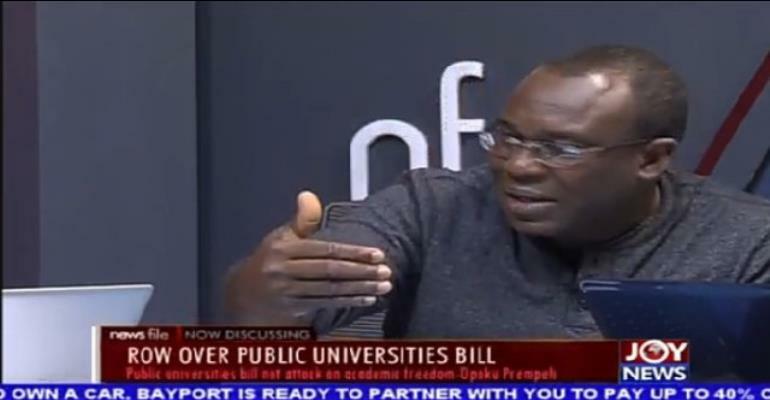 It is his view that the current system of administering Ghana’s public universities has not posed any challenge or problem for which a bill is required to cure same. Mr. Apaak argued that the Bill when allowed to become law, will rather create serious problems. He points to reserving majority slots on the University Council for government appointees, giving organized university stakeholders just a representation on the university council and harmonizing the administration of all public universities by a common management platform as some of the challenges to arise from implementing the bill. Illustrating his position, he asserted that the new arrangement is only a conduit for government to control decisions of the university given that the oversight responsibility of the University council invariably affects how lecturers are appointed, how research is financed and policy decisions on the university campus. “The council will become an instrument for government control. What will be the purpose of changing the composition of the current council if not for the purposes of direction and control?” he told Evans Mensa, sit-in-host for Newsfile. The Vice President of IMANI Africa, Kofi Bentil, agrees. “What problem are they trying to solve?” he asked. “Why do you go through all these challenges if the problem you are trying to solve is not clear? I am looking for the problem but I still cannot find it,” Mr. Bentil said of the new Bill. Like Clement Apaak, he is settled that the Bill is merely a backdoor approach for politicians to control what goes on on the university campus. He said this is dangerous because a political office is transient. “Those who come after you will use it against you,” he said on the same programme Saturday. Bentil is of the view that enough laws exist to manage each university in itself. He added that the diversification of management of universities is in the spirit to realise the unique purpose for which each university was established, arguing that it will be inappropriate for technical universities to start offering humanity programmes, which is what the harmonisation may achieve. Bentil and Apaak are in rich company. 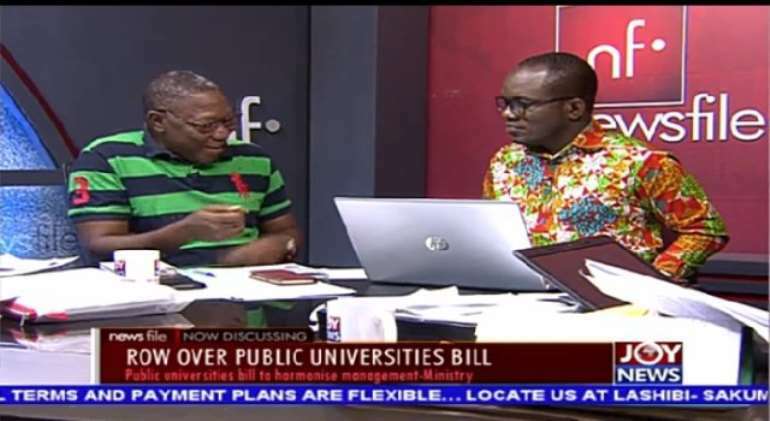 Professor Yaw Gyampo, a political science lecturer, Prof Ernest Aryeetey, a former vice chancellor of the University and Professor Kwadwo Appiagyei-Atua, a law lecturer of the University of Ghana and a representative of University Teachers Association have all questioned the motive for the new bill. For instance, Professor Kwadwo Appiagyei-Atua commenting on Joy FM’s Super Morning Show on Monday said “Reserving majority slots on the University Council for government appointees, giving the right to appoint the Council Chairman to the government, deferring the power to dissolve Council and reconstituting an interim one to government amount to grave attempts at undermining academic freedoms.